NAMM always attracts its fair share of guitar icons, and Friday at this year's show proved to be no exception. Midday saw a throng of camera-toting reporters gathered at the Korg stand to hear all about a new collaboration between Vox and Joe Satriani. Sure enough, the virtuoso six-stringer was there in person, but as for product, there was nothing to be seen. Essentially, the skinny is as follows: there will be Joe Satriani signature pedals from Vox, one day, at some point, perhaps in the summer. For now though, nothing. According to Satriani, the pedals are still going through the R&D process and their cosmetics are still to be finalised. This is all well and good, but the sense of disappointment amongst the gathered media personnel and Satch groupies was palpable. What good is a 'Vox announces Joe Satriani signature pedals' story without specifications, pricing, sound clips, or even model names? Hopefully there will be more on what could prove to be a very interesting collaboration at Summer NAMM. So, after the extremely anticlimactic Satch press conference, and following a super-sized lunch of approximately 5,000 calories, we headed over to the Marshall stand. Having already witnessed Slayer riffmeister Kerry King - who these days looks like he's in the Legion Of Doom - doing a signing and posing for photographs earlier in the day, we expected similar scenes when the former Guns N' Roses guitar genius and all-round pleasure-seeking legend that is Slash took to the stand. However, perhaps we, the guys at Marshall - whose big product news at NAMM is a Randy Rhoads tribute stack - and certainly the show security, may well have overlooked the fact that Mr Slash - also unveiling a signature Gibson Les Paul at the show - is actually still a very big star indeed. 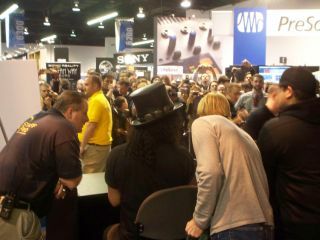 The Slash signing was scheduled for 3:15pm, but at least an hour before, there were something like 800 people queuing to get a signed picture and shake the hand of a proper, old-fashioned rock star. As it got closer to the allotted time, it became clear that this event was by far the biggest draw of show so far. When he emerged, complete with top hat and looking remarkably healthy for a man who has done more drugs than every touring funk band in the world combined, there was pandemonium. Now, we wouldn't want to November Rain on Marshall's parade - the event passed without a stampede and without any injuries - but It's So Easy to forget just how big a star the guy is. Lest we forget, NAMM is a trade show, not a public show, but that didn't stop extraordinary scenes, with the show security staff genuinely struggling to keep the crowds in check. Reporting here from this Paradise City, I'll sign off for now, but it just goes to show that two decades on from the release of the Guns N' Roses debut album, there's still plenty of Appetite for Slash.